The spring game constitutes a recruiting opportunity for programs across the country. There might not be a more important event in recruiting outside of junior days and official visits. It’s a chance for the Texas coaches to showcase the current state of the program to fans and the next generation of prospects. Texas is expecting dozens of recruits to arrive in Austin for the Orange-White Game on Saturday night. Here is a closer look at 13 of the most important names visiting Austin. The latest: Evans plans to take his time in the recruiting process, but his presence in Austin can only mean positive things for the Longhorns. Evans wants to play behind a strong offensive line and the Longhorns already hold three commitments at that position in the 2020 class. Evans’ teammate, offensive tackle Damieon George, is also a top priority for the Longhorns and Evans is on record stating that he’ll attend the same college as George. Saturday presents Texas an opportunity to showcase the new-look rushing attack and an improved offensive line to the best running back prospect from Texas in nearly 10 years. The latest: Umanmielen is an important recruit for Texas in the 2020 class for two reasons. First, he fits perfectly into the odd-man front Texas enjoys utilizing. Umanmielen is a big-bodied defensive lineman who can play defensive end or defensive tackle. He’d be a candidate for the 4i position Texas uses frequently. He’s also a local product and with the growing talent in Austin, it’s important for the Longhorns to win battles in their backyard. The latest: Dorbah plays defensive end for state champion Highland Park. He’s a pass rush specialist who would line up at B-Backer at Texas. He lacks the ideal length and size to play defensive end. Dorbah is likely to be an outside linebacker who specializes in rushing the passer. He’ll need to learn to play in space. Texas is in great position with Dorbah, who listed Texas as his leader in March. The latest: Texas identified five offensive linemen it wants in the 2020 class. Three are already committed. George, a teammate of Evans at Galena Park North Shore, is one. Lindberg is the other. Lindberg is the top-rated offensive tackle in Texas. He’s the most college ready of any big man in the state. Two of Texas’ three current commits are likely to end up at guard or center. The Longhorns need long, mean offensive tackles to compete for national titles next to SEC programs and Lindberg is the type of player who can bring that physicality needed to match up with LSU, Georgia and Alabama. The latest: If there is a player in the state that reminds scouts of 2019 star DeMarvin Leal it is Broughton, a big-bodied defensive lineman who is growing into a true defensive tackle. He’s still relatively new to football and improving with each snap at elite camps. He’s visited Texas multiple times and the Longhorns feel good about making him the centerpiece of the defensive class if Broughton decides to commit. The latest: Omeire is a physical freak of nature. He’s the rare wide receiver who already looks ready for college football due to his physical size and stature. Omeire is still raw as a route-runner, but the upside is through the roof for him as a wide receiver. He was born with unteachable skills and this visit to Texas appears important since he’s already been to campus this month. Texas is yet to gain a commitment from a wide receiver in the 2020 class. The latest: Collins is of similar importance to Texas as Umanmielen. Those are the two best players in Austin and both play a need position for the Longhorns. Collins is more of a true defensive end than Umanmielen and Broughton. He’s longer than Dorbah and capable of adding enough weight to be a three-down defensive end in an odd-man front. He could also play B-Backer on passing situations. His mother Benita Pollard played basketball at Texas. Collins is also high on Texas A&M. The latest: Eaton exploded onto the recruiting scene this offseason once colleges saw his height and frame. He’s a big corner who can flip his hips and run with nearly any wide receiver in the state. He’s gained offers from all the elite programs in the nation, so it’ll be a dog fight to land the talented cornerback. The latest: There isn’t a more versatile defensive back in Texas than Alford. He can play corner, nickel or safety. He’s a real ballhawk and plays much bigger than his frame suggests in the run game. Texas is firmly in the mix for the talented safety alongside Texas A&M and others. Alford led Shadow Creek to a state title appearance in its first season as a varsity squad. Alford is among a trio of top safety prospects alongside Bryson Washington and Chris Thompson Jr. The latest: Texas wants two running backs in the 2020 class. Evans is the top priority. Robinson is a player emerging onto the scene for the Longhorns. Arizona treated Texas well in the 2019 class with signatures from wide receiver Jake Smith and tight end Brayden Liebrock. 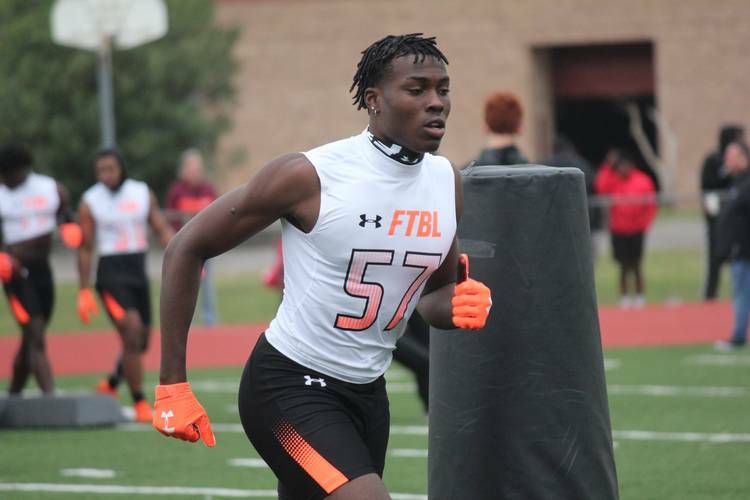 The Longhorns hope to pull off the same feat in 2020 with Robinson and five-star cornerback Kelee Ringo. All Saints offensive tackle Tommy Brockermeyer receives instruction from former Longhorn Jonathan Scott at The Opening regional in Dallas. The latest: Brockermeyer is undoubtedly the most important recruit for the Longhorns in the 2021 cycle. He’s a Texas legacy with his dad Blake starring at Texas and in the NFL as an offensive lineman. Tommy is considered the top offensive tackle in the nation, per 247Sports. He’s a long, mean kid with athleticism and pedigree. He’s dominated 2020 stars at elite camps this offseason and is heavily favored to wind up in burnt orange. The latest: James isn’t as highly touted as his brother Tommy, but he’s a target for the Longhorns and a future prospect at center as he continues to add weight and strength to his frame. Older brother Luke is already on campus as a preferred walk-on and it’d be surprising if the duo of Tommy and James didn’t follow suit in the 2021 class. The latest: The last player Texas signed from Spring Dekaney was tight end Malcolm Epps in the 2018 class. He’s enjoyed a fantastic spring at wide receiver and should see a bigger role in the passing game as a sophomore. Gumms is a traditional tight end with more blocking prowess than Epps because of Gumms’ size. He’s the only tight end in the 2021 class to currently hold an offer from the Longhorns. The latest: A more electric slot receiver doesn’t exist in Texas. Earle is a dynamic playmaker who can play H-Back or in the slot for the Longhorns. He’d be a big win for Herman’s staff because he plays at a DFW power that the Longhorns hope to build a pipeline with in the coming years. His playmaking ability is uncanny.